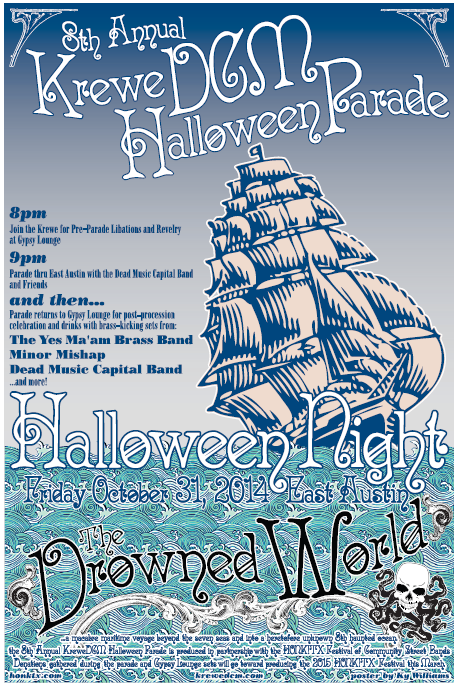 Halloween 2014, KreweDCM embarked upon a macabre maritime voyage beyond the seven seas and into a heretofore unknown 8th haunted ocean, the Dead Green Sea. “The Drowned World” was produced in partnership with Honk! TX as an exploration of a watery existence, warped by the crushing depths of the Dead Green Sea. Sea witches, drowned sailors, and lovers of leviathans came to witness the maiden voyage of KreweDCM’s undead whaling ship, the HMS Phorcys. The DMCB Halloween Mega-Band lead the procession through East Austin. After the parade, the Krewe returned to the Gypsy Lounge for a post-parade show benefiting HONK! TX featuring brass-kicking sets from Dead Music Capital Band, Yes Ma’am Brass Band, Minor Mishap Marching Band, and more. Photos courtesy of Austin Hansen.